The 33rd annual Larry H. Miller Utah Summer Games will commence with the Opening Ceremonies on Thursday, June 14 at 8:30 p.m. The games bring forward the best of the best through its Olympic style athletic events to celebrate excellence in the human spirit and healthy lifestyles. The Utah Summer Games has been held in Cedar City, Utah since 1986 hosting athletes of all ages and skill levels from across the western United States participating in more than 40 different competitive sporting events. The games continue to average a total of 9,600 participants, 50,000 spectators, and 1,000 volunteers with those numbers increasing each year. The games continues to grow and enhance its offerings. This year athletes can experience three news events that include power tumbling, golf, and high power rifle shooting. Game participants and members of the Cedar City community are also invited to enjoy the new Summer Games Party in the Park, a fun evening event hosted at Main Street Park on June 8th, 15th, and 22nd starting at 7 p.m. Prior to the Opening Ceremony is the free Summer Block Party, sponsored by the KSL Read Today Initiative. The block party will be from 3 to 7:30 p.m. on June 14 in front of the SUU America First Event Center on 800 West. There will be food trucks, face painting, games and prizes. 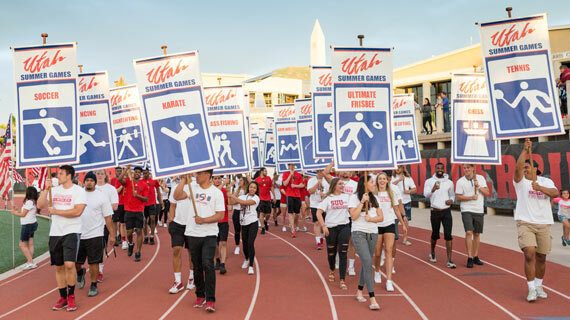 Following the Block Party, the Opening Ceremony will start at 8:30 p.m. in the Southern Utah University Eccles Coliseum and will feature the athlete’s march, family-friendly activities and fireworks. People won’t want to miss this year’s featured performer, Steve Augeri, former lead vocalist from the hit band Journey. To attend the Opening Ceremony, general admission is $5 and reserved seating is $8. Athletes can attend for free by wearing their official Utah Summer Games athlete t-shirt. There are no youth/child prices for this event. Tickets can be purchased at SUU’s America First Event Center Ticket Office at (435) 586-7872 or online. They are also available for purchase at the gate.